Named in honor of the operetta Rob Roy, based on the life of Robert Roy MacGregor, the Rob Roy Cocktail was created in 1894 at the Waldorf Astoria New York. A Rob Roy is much like a Manhattan but made with Scotch instead of Rye Whiskey or Bourbon. 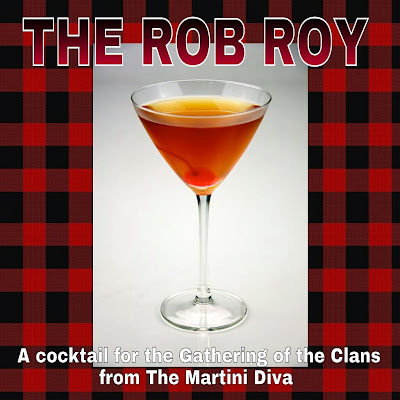 Like the Manhattan, the Rob Roy can be made sweet, dry, or perfect. A standard Rob Roy is sweet, made with sweet vermouth, a Dry Rob Roy is made with dry vermouth and a Perfect Rob Roy is made with equal parts sweet and dry vermouth. And, yes, that is the Rob Roy MacGregor tartan in the image! Shake with ice and strain into a chilled martini glass. Garnish with the cherry.